Waiouru: Is fitting a Heat Exchanger to Waiouru a financially viable option? Is fitting a Heat Exchanger to Waiouru a financially viable option? From a cost benefit perspective the heat exchanger doesn’t appear to be a viable option. Jan and Graham of nb Whistler walked past Waiouru on their way back to Frouds Bridge Marina after looking at the river conditions downstream at Ufton Nevet. 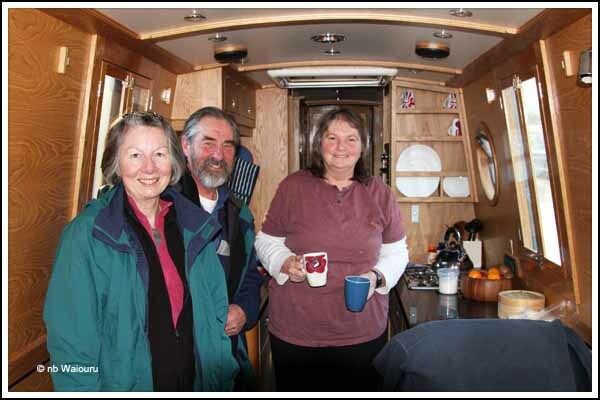 They accepted an invitation for a cuppa and we had a great discussion about many things “boatie” before they had to depart. After a significant amount of reconfiguring the connections between Blogger and Picasa I’m hoping the problem with the link to the photos on Picasa has been rectified. I concluded the problem was Google+ and removed it. Then I had to go back into our Google account and change the url link to Picasa. So if you click on a blog photo it should now load the relevant Picasa Album. Please let me know if it doesn’t! I’m still attempting to resolve the problem in the blog comments where some of you who leave comments receive a “noreply@blogger.com response. The “fix” as reported by Blogger isn’t working <grrrr>. Yeah.. the Picassa links are working now... well done!! Thank you for the advice Kevin. Can I ask if you also receive the "noreply@blogger.com" message? I recently fitted a heat exchanger system to our boat. Not the Aldi one. I got it from Ebay, around £30-something for a German plate exchanger such as might be found in a Combi boiler. Plus a pump from SolarProject, total cost including fittings around £100. Beta engines dont run very hot but it keeps the rads a bit too hot to touch, but not as hot as they are with the CH on. Anyway, I'm very pleased with the results - its on CWDF if you are interested. That's very interesting. I've found the relevant thread (I think) and will read it thoroughly tonight. I've also searched eBay and found a Plate Exchanger for £35. At this price it makes the idea financially more viable. Oh, and I'm still working away at the configuration of the GSM module on the Empirbus system.